As the annual talent contest draws near, Fox, Bear, Penguin and Rabbit are all busy practising their acts. Penguin is desperate to discover his own personal prowess; but it certainly isn’t juggling, magic or even burping the alphabet, as his friends suggest. 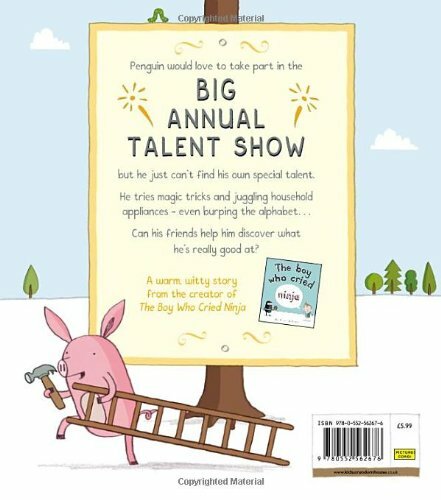 Never mind, decides Penguin offering himself as Talent Show organiser in chief, a task he does with great skill. The show is a resounding success but when it comes to the medal ceremony, Penguin decides he has nothing to celebrate and heads home. Thereupon the others determine to give him a thank-you party. However, the party is a distinct disappointment. It’s then that Penguin finally realises his own special talent is for organisation. Latimer’s illustrative style is quirky and distinctive. The objects and characters that populate the snowy landscapes and interior scenes are simply drawn and appear almost as if they have been cut or pressed out of thin sheets of play dough before being arranged on the page. At once detailed yet uncluttered, the resulting spreads – half, full, double or cartoon strips – provide much to absorb at every turn of the page.